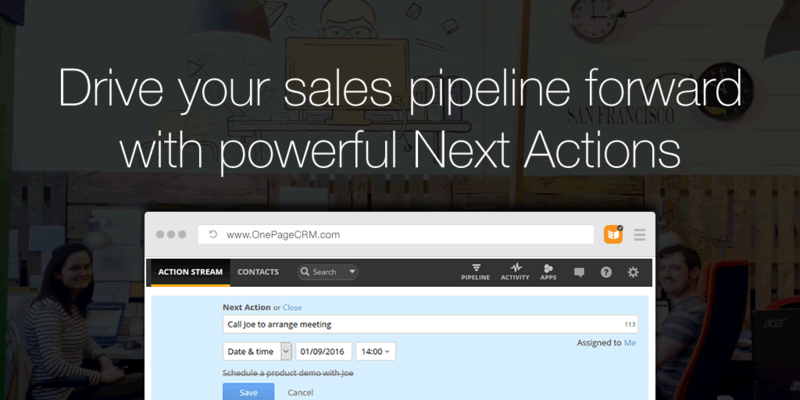 At the very roots of OnePageCRM is our Next Action Sales method. Based on David Allen’s GTD (Getting Things Done) productivity principles, our aim is to ensure you never drop the ball on a potential customer. The Next Action sales method encourages you to allows follow-up with a lead. However, to really benefit from its use, you must set proactive, actionable Next Actions that convert! Here are our top tips for constructing powerful Next Actions. Use a verb at the start of the statement, this will trigger action, rather than procrastination. Actions should be decided upfront – so when the time arrives for ‘doing’, you’re half way through the battle. Be specific about what needs to be done, so that you can glance at the list and get an overview, without too much investigating. Always use the contacts name. This reinforces a connection between you and your prospects and gets you ready for interaction. Remember, it takes an extra one or two seconds to write the sales action properly – but could mean the difference between winning and losing a sale.